Fronting a band that consists of her father, brother, and uncle, 11-year-old Emily Sunshine Hamilton belts out old-school Americana with an angelic clarity. Completely on her own terms, the East Tennessee phenomenon who performs as EmiSunshine has taken the nation by storm as a singer, songwriter, and multi-instrumentalist. 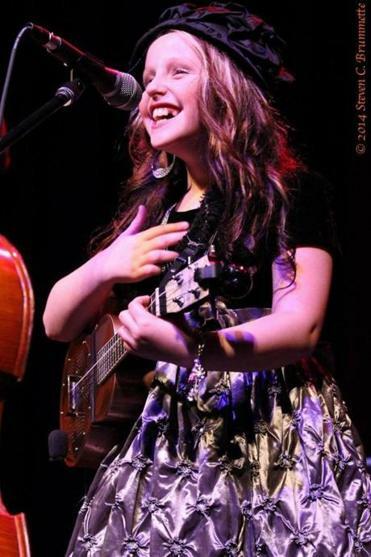 She has appeared on the “Today” show and performed at Nashville’s Ryman Auditorium, and is also one of the youngest artists ever to play at Tennessee’s historic Grand Ole Opry. According to her family, Emi’s potential for stardom has been brewing since she was born. At age 4 she sang at her aunt’s wedding; at 7 she began to master the ukulele. EmiSunshine now performs around 150 shows a year, touring with her entire family. She has just released an album, “Black Sunday ’35,” and on Friday she’ll take the stage at Johnny D’s in Somerville. In a recent telephone interview, Emily and her mother, Alisha, talked about touring and life on the road. Q. So where is EmiSunshine right now? Emi: We are in Nova Scotia! Q. Is this your first big tour? Alisha: Yes, we’ve definitely done a collection of shows before, but this is our first big tour. This is our first time playing out of the country. Q. Where have you played so far? Alisha: California, Nova Scotia, and now we’re heading to Philadelphia. Q. What’s been your favorite venue to play? Emi: Definitely Grand Ole Opry in Tennessee. It’s just such a big stage for country music. It was great to play there. Q. Emi, in an interview with “Nashville Scene,” your mother said you enjoyed “sad music” as a kid. What drew you to melancholy music at such a young age? Emi: I’m not really sure; I just really liked it. I liked the way it sounded to me. Alisha: Yeah, she just kind of clung to it. It’s just always been her favorite type of music. Q. Lots of young musicians in your position would consider going on “America’s Got Talent” or something of that sort. But from past interviews, it seems clear that you don’t want anything to do with those competitive shows. Why is that? Emi: I just don’t really like competition. I remember one time I was in a competition in the Tennessee Valley, and it came down to me and this other boy. I ended up winning, but the boy started crying after he lost. I felt so bad, so ever since then I haven’t really liked competing. Q. You have a Web series on your EmiSunshine YouTube channel called “Americana Corner.” How did the idea come about? Alisha: Emi just has always loved learning from and playing with other artists. It was an idea we came up with to bring all that together. Q. Emi has gotten a lot of praise for the mature lyricism in her songs. Alisha, I know that you also help her write her songs. Where do you draw inspiration for your lyrics? Alisha: Yes, a lot of the time whatever lesson I’m teaching her is what she draws inspiration from. For example, we just wrote a song the other day about Texas, and we had just done a lesson on the history of Texas. Q. How often do you do lessons together? Alisha: I try to home-school her every day. School is very serious in our family. Emi is fierce, though; she always wants to learn. Q. That’s great. So Emi, how many instruments do you play? Emi: I play ukulele, banjo ukulele, mandolin, guitar, and I’m learning fiddle and accordion. Q. What’s your favorite instrument? Emi: Definitely ukulele, because it was my first instrument. I wanted to learn guitar first, but it was too big for me at the time. Q. What is a fun fact people may not know about you? Emi: Well, I have a mini-farm back home. It’s got pot-belly pigs, chickens, and some other animals on it. They all have names too. Q. What do you guys see for the future of EmiSunshine and the Rain? Alisha: We just take it one day at a time. Emi is so young, so I tell her all the time that if she wants to stop, we can stop, and that will be that. Q. But that day hasn’t come yet? At: Johnny D’s, 17 Holland St., Somerville, Friday at 8 p.m.
Interview was condensed and edited. Mackenzie Cummings-Grady can be reached at mac.grady@globe.com.